This recipe is so simple that it should be in every cook's back pocket and to be honest, I am almost ashamed to share because it is so simplistic. When you are in need of a quick yet elegant side dish, this should be a go to recipe, plus, I bet you already have all of the ingredients on hand! You can also mix up the seasonings to any blend you want. The technique is the only constant in the recipe. You could literally do a different variation every night of the week. Note: This recipe makes 4 servings. 2. Place the cut potatoes into a large pot of cold water. Place the pot onto the stove and heat on medium-high heat with the lid tilted to avoid boiling over. 3. Once the water comes to a rolling boil, cook for 20 minutes or until the skin starts to pull away and the pieces are tender when stabbed with a knife. 4. Drain the potatoes and return to the hot pot. Returning the potatoes to the hot pot allows the excess moisture to be evaporated so they are ready to absorb the most butter possible! 5. Place the butter into the pan with the potatoes and sprinkle the seasonings over the top. 6. Place the lid back onto the pot and gently swirl the pot to coat the potatoes with the butter and seasonings. 7. 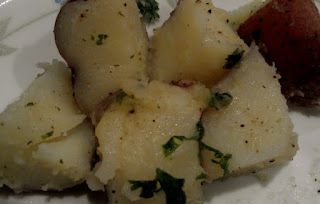 Pour the coated potatoes into the serving dish and top with the chopped parsley. Lightly toss to incorporate the parsley, being careful not to break apart the potatoes. That's it! Now all you have to do is serve and enjoy.